If you are a bird lover, butterfly lover or nature lover, make a stop at the 164 acre Audubon Bird Sanctuary on Dauphin Island, which is a 14 mile long barrier island off the Gulf Coast of Alabama. Wild bird Magazine has named Dauphin Island as one of the top four North American locations for viewing spring migrations and is also one of the ten most globally important sites for bird migration. The island is the first landfall stop for neotropical migrant birds after their long and arduous flight across the Gulf from Central and South America each spring, and their final resting and feeding place before making the trip back in the fall. Camping, both RV and tent sites, is available on the island at the Dauphin Island Campground. It's only a short walk from the campground to the sanctuary or to the beach. There are 150 campsites total ,with 70 having sewer hookups. To make reservations or for more information on camping call 251.861.2742. Fishing is another popular activity on the island with 10 fishing rodeos hosted there each year. A four mile long bridge connects the island to the mainland, making access easy and convenient. 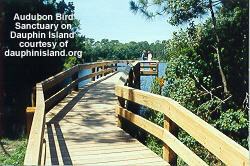 For more information about the island, the bird sanctuary, and other amenities on the island, visit their website.